TOP > 最新情報 > Small size 35x35mm！Wireless power supply 720mW!Can be placed anywhere! Small size 35x35mm！Wireless power supply 720mW!Can be placed anywhere! 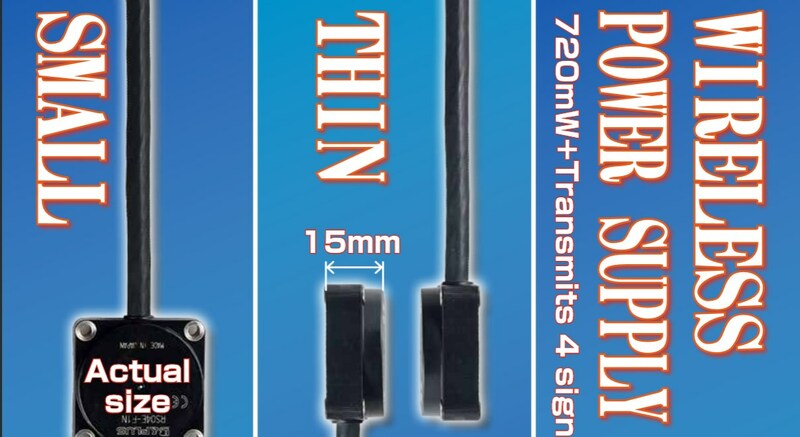 We've released a new remote system that can wireless power of 720mW in the small, thin shape of 35x35x15mm. This product is in square shape of 35x35mm, thickness 15mm thin shape! Four fixing method also screw! install in the fixed side, and this system can let you drive four points of connected sensors. The fixed side can feed back ON/OFF signal with a sensor at the same time. And it can completely make a sensor wireles. The small & thin design or a small robot which does not take up space and can be placed anywhere! It is safe even if it takes is water and dust so waterproof and dustproof structure.